Time for another post! Apologies about the 36 hour delay :). I just returned from driving my Godson back home to Maryland. Miss him so much already! I’ll be posting more about our adventures during this past week later. But check out my Instagram (@thekglifestyle) if you can’t wait. Hehe. Sooo, I’ve got some updates!!! 1. This will be the last Forgiveness Friday post. I SINCERELY want to thank you all for reading these posts during these past weeks. For those of you who have commented and emailed me, THANK YOU! Your stories and your encouragement were truly appreciated. Once I made time to compose these posts the words flowed just as I expected, easily. I truly believe teaching this message of forgiveness is apart of God’s purpose for my life. 2. A new series is coming! YES! I’m not about to just leave y’all hanging now. Lol. I’m calling it the “WHOLE Series”. Have you ever seen an episode of Oprah’s Master Class on the OWN network? Y’all already know I love OWN! During the intro of the show Jane Fonda is quoted saying, ” We’re not meant to be perfect, we’re meant to be whole”. When I heard those words during her episode, I remember thinking “YES!!!!”. I made a mental note: Let me just get to MY “perfect”, where I AM whole. So these posts (also on Friday’s) will feature a piece of my journey to wholeness. Relationships, life balance, etc. I’ll be praying that God will lead me to share what it is He wants me to share. It’s going to be good! 3. Last but definitely not least, I’m on a DAILY post challenge. I’m challenging myself to post once a day each weekday for the month of August. What’s funny is that I have all this content (pictures and video) that I just let sit in data storage with the intention to post. No more of that! If you miss the daily posts, don’t worry! I’ll send out a recap newsletter at the end of the week so that you can catch up. NOTE: Don’t forget! You can manage how often you’d like to receive emails from me using WordPress Reader. They’ve upgraded the notifications feature and you can now manage emails to deliver weekly, daily or never. Here’s the link, click here. That’s it for updates! Let’s get to the purpose of this post! Over the past several weeks we’ve gone over how to prepare our hearts, how to have a purposeful forgiveness conversation, how to do the work of forgiving and how to manage our relationships. It’s been a journey of self-reflection and analysis of our interaction with others. I’d like to end this series with a reminder. Mind your business. 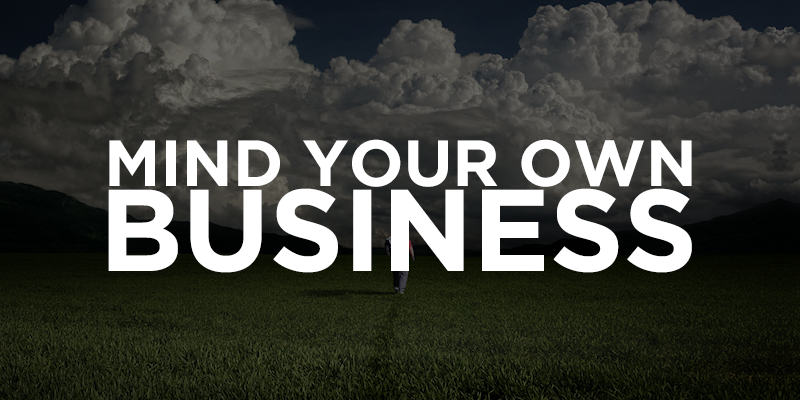 Your OWN business is what is most important in life. Our relationship with Christ is an individual decision and pursuit and in the end it’s all that matters. If our relationship with Christ is thriving ALL areas of our life will thrive as well. Our obedience and our faith will show up in our daily lives. But the distractions, when we DON’T mind our own business will get in our way EVERY time. Minding our own business is particularly difficult in today’s modern culture. Almost everything we see in the media and social media is about what everyone else is doing, saying or buying. Let me be clear, there is nothing wrong with being inspired and informed. But in today’s reality TV world we’re tempted to compare ourselves and create goals that have nothing to do with our purpose. The obsession our culture has with following every move that a celebrity is making or staying up-to-date with every event in our “friends” lives on Facebook, cripples our individuality and skews our passion. Imagine if we could use the hours we spend on social media or watching reality television, reading, brainstorming on our next project or spending time with Jesus? We would be more knowledgeable, purpose driven and uplifted! When we mind our business we are tending to our business free of distractions. My pastor had a great example of this concept during a sermon several weeks ago. The message featured a story about Nehemiah. Nehemiah was given an assignment by God to rebuild the walls of Jerusalem. Nehemiah 6:1-15 outlines the MANY times others tried to get him to stop working and distract him from his work, his mission, his purpose. These distractions came in the form of rumors, threats of death, schemes and tricks. He stayed relentlessly focused on the task he’d been charged with. He never came down from working on the wall, so messengers and aides had to communicate with him on the ground. In other words, every time a distraction came he told them, “Ain’t nobody got time fo that”. I absolutely loved how focused Nehemiah was when distractions came his way. 1. He listened carefully: It’s important to pay attention while building. 2. He spoke wisely: Never put something in writing that goes against wisdom. Nehemiah didn’t reply to the letters with threats or provoking. He knew that they meant to do him harm but he didn’t tell them, he just kept building. 3. He worked relentlessly: Don’t let the devil use distractions to keep you from enjoying your season. Keep building, that agitates the enemy because the building doesn’t stop. Get happy to get them back by relentlessly building. 4. He rejected the rumors: On the 5th time Nehemiah rejected the rumors (Nehemiah 6: 5). You can’t chase destiny and rumors at the same time. Resist the impulse to address the rumors. The minds of those who are necessary for your destiny will be clear from rumors. Everyone will not like you, so accept that. To those who matter, God will keep from the message from Satan. Nehemiah had to resist the distractions. Sadly today, we’re so accustomed to LOOKING for distractions. Procrastination is real! And we’ve been given tools of distraction created to keep us from doing God’s work. Trust me, I know, it’s difficult to stay focused. However, I believe the closer we get to Christ, the more we fear Him and desire to do His will for our lives. With His guidance we’ll manage our relationships accordingly, removing those who keep us distracted. Loving them from afar. Lately I’ve been distracted which is why this and all of the other Forgiveness Friday posts have been for me too! Anytime I find myself comparing myself and the progress I’m making in any area of my life, I do my best to shut it down. I refuse to come down from the wall I’m building – the purpose that God has put on my life. And the only way to do this is to mind my own business. Stop wondering what your ex is doing, stop comparing yourself to the so-called “fabulous life” that others are portraying to be living. The grass is not always greener and even if you find yourself in so and so’s place of status you’ll find yourself unhappy and miserable. We’re meant to be WHOLE in our purpose, not their’s. That is where we’ll find peace, joy and understanding from God. My prayer for us all (including myself) is that we’ll have laser focus on our purposes’ and the ability to remove distractions from our lives. Lord, thank you for this word and for each day we’re given to keep working at resisting distractions. Thank you for guiding us and loving us so much! We pray that you will convict us when we seem drawn to distractions in the form of rumors, threats or others. We pray for strength just as Nehemiah did as he was rebuilding the wall, to resist distractions. Thank you for the other messages you’ve sent our way to give us clarity on forgiveness, and thank you Jesus for being the ultimate role model for us. We pray for your continued guidance as we continue our journey’s in love for everyone we encounter. Amen! Please let me know your thoughts below in the comment section and ASK ME ANYTHING below or at thekglifestyle@gmail.com. I would love to hear from you and answer your questions in next week’s WHOLE post! What a blessing! I’m so glad God wrote it on your heart to share all this content. Your distractions bit was right on time as I prepare to start a new school year as a school-based SLP. Thank you Kala; and I look forward to your daily posts!